Carte du Congo et du Pays des Cafres. Par G. de l'Isle de l'Academie Royale des Sciences. A Amsterdam, Chez Jean Covens et Corneille Mortier, Geographes. An extraordinary example of Covens and Mortier's c. 1730 issue of De L'Isle's important c. 1707 map of Africa south of the Equator. Depicts the southern Africa in stunning detail with numerous notations an comments regarding the people, geography, and wildlife of the region. De L'lsle was very a cautious and scientific cartographer, basing his maps on the first hand reports from sailors, merchants and missionaries that, at the time, were flowing into Paris at an unprecedented rate. This map offers significant detail throughout the interior naming numerous tribal areas and kingdoms including the Jaga, the Kongo, the Angola, the Kingdom of Numeamaie or Mono-Emugi, Monomotapa, Gingiro, and others. Shows the Portuguese trading colonies of Sena and Tete (Santiago) on the Zambezi River. Also near the Zambezi, 'La Victoire Couvent de Dominicains' is worth of mention. Also notes the predominantly Arab island kingdoms of Pemba and Zanzibar. Identifies the Dutch colonies near the Cape of Good Hope, including 'Fort Hollandois' (Cape Town). The condition of this map bears special mention. We have rarely encountered an antique map from any era in such outstanding condition. The condition of the paper, the quality of the engraving, and the overall state of preservation of this map is beyond compare. If you are considering adding an example of this map to your collection, this is the one you want. Covens, J. & Mortier, C., Atlas nouveau, contenant toutes les parties su Monde, ou sont exactement remarquees les empires, monarchies, royaumes, etats, republiques, &c. Par Guillaume de l'Isle, c. 1830 editon. Incredible. A nearly flawless example. We have rarely seen any 18th century maps in such phenomenal condition. Wide clean margins. White clean paper. Dark heavy impression. Original centerfold - as issued. If you plan to add an example of this map to your collection, then this is the one you want. Rumsey 4638.091 (1742 edition). 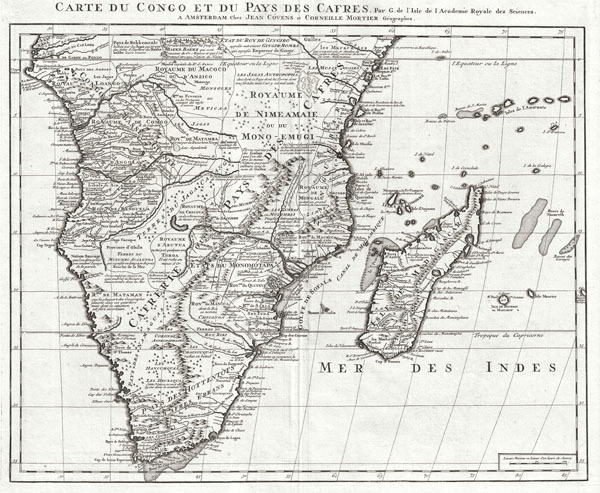 Tooley, R. V., Collector's Guide to Maps of the African Continent and Southern Africa, p. 72.